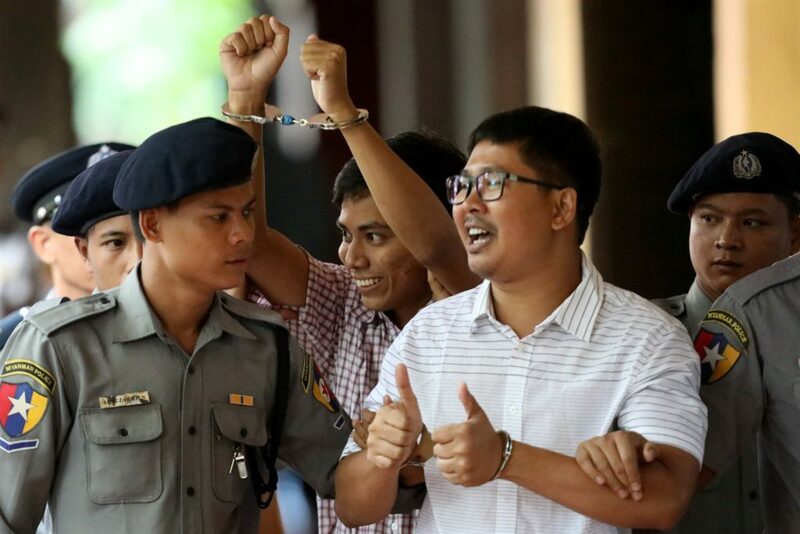 A judge on Monday found two Reuters journalists guilty of breaching a law on state secrets and sentenced them to seven years in prison, in a landmark case seen as a test of progress towards democracy in the Southeast Asian country. Yangon northern district Judge Ye Lwin said Wa Lone, 32, and Kyaw Soe Oo, 28, breached the colonial-era Official Secrets Act when they collected and obtained confidential documents. Press freedom advocates, the United Nations, the European Union and countries including the United States, Canada and Australia had called for the Reuters journalists’ acquittal. The reporters had told the court two police officials handed them papers at a north Yangon restaurant moments before other officers arrested them. One police witness testified the restaurant meeting was a set-up to entrap the journalists to block or punish them for their reporting of a mass killing of Rohingya Muslims. The verdict means Wa Lone and Kyaw Soe Oo — who both have young daughters and have not seen their families outside of prison visits and court hearings for nearly nine months — remain behind bars. Kyaw Soe Oo has a three-year-old daughter and Wa Lone’s wife, Pan Ei Mon, gave birth to their first child last month. It comes amid building pressure on the administration of Nobel laureate Aung San Suu Kyi over a security crackdown sparked by militant attacks in August 2017. The Reuters reporters were arrested on Dec. 12 while investigating the killing of 10 Rohingya and other abuses involving soldiers and police in Inn Din, a village in Rakhine state. But the military acknowledged the killing of the 10 Rohingya men and boys at Inn Din after arresting the Reuters reporters. The verdict had been postponed for a week because judge Ye Lwin was sick.